Suddenly, it clicked, the reason none of my ideas, dreams, or goals have succeeded. I’ve never hustled for it- never put in the time and put the elbow grease into anything I’ve wanted. I’ve created some amazing jewelry and made wonderful incenses, but it has never gone anywhere. I have never gone the extra mile! This was my latest jewelry project. 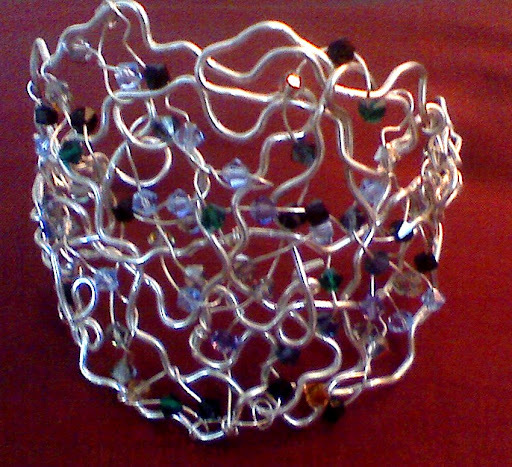 This beaded cuff was designed for a very special friend’s iniation. It is made of sterling silver wire and contains 52 swarovski crystals. It is one of my favorite pieces `;~) So, yes, I can create beautiful work and I am good at it. So what has kept me from hustling it? What has kept me from doing the work? Honestly, nothing! It’s not that I expect things to just fall in my lap, though on occasion it does happen `;~) It’s more that I’ve …. hmmmm…. never developed those skills. I don’t know how to drive and push myself. I don’t know how to overcome that moment when nothing happens after the launch. I don’t know how to follow through. I don’t want to get into why I did not develop these very necessary skills. It is in my past and it is over and done. So in many ways, part of my work this year is going to be developing those skills. Learning how to follow through and not give up throwing my hands in the air and saying “oh well.” I don’t want to live an “oh well” kind of life. I’m tired of living a life where I am constantly hearing how much potential I have. Or how smart I am. and not having a clue what to do with it! And no, I do not know how to apply myself. What the hell does that mean anyway? To apply myself??? I’ve never understood this. When I see what I’ve written, I want to erase it all. It makes me worry that maybe I really do have mental issues, some kind of social disorder or that maybe I really am totally mental. Maybe I should get in therapy. But then I would have to drag all these old issues back up. This is not where this post was meant to go, so I may indeed erase some of those mental shuffling that is going on here. It’s funny how writing brings out all these things. SHould I filter myself? Isn’t that what I’ve done all my life? Filtered myself down until I could fit into the molds of society?